Stock components apart from front elixir 5 break, tyres, bushes, brand new grips and carbon bars.In good condition just the expected visual wear and tear. 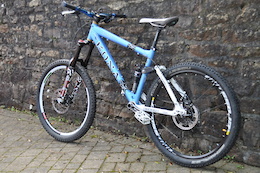 very good value for money here, only selling as trying this 650b malarkey. The Video of his crank snapping is on his youtube!